NETWORK FINALS: There were no adjustments from the Saturday preliminary ratings. CABLE HIGHLIGHTS: ESPN had 3 COLLEGE BASKETBALL games in the Saturday cable Top 10, led by UCLA vs. Arizona at 0.65. (Note that HBO, as is its practice, listed its run of the theatrical movie MIKE & DAVE NEED WEDDING DATES as an “original.”) The Adult Swim animated line-up performed as follows: the late-night DRAGON BALL Z ticked up to 0.40 (the primetime edition was up 0.05 to 0.40), JOJO’S BIZARRE ADVENTURES up 0.06 to 0.43, MOBILE SUIT GUNDAM up 0.08 to 0.39, HUNTER X HUNTER up 0.04 to 0.37/827K, NARUTO up 0.03 to 0.34/767K, ONE PIECE up 0.01 to 0.28/603K, and GHOST IN THE SHELL up 0.02 to 0.25/579K. Nickelodeon’s 10AM SPONGEBOB was in the Top 10 at 0.48 with lead-out BUNSEN IS A BEAST at 0.37, and Disney Channel’s 9AM ELENA OF AVALOR was in the Top 15 at 0.38. Fox Sports 1’s NASCAR race was at 0.40. 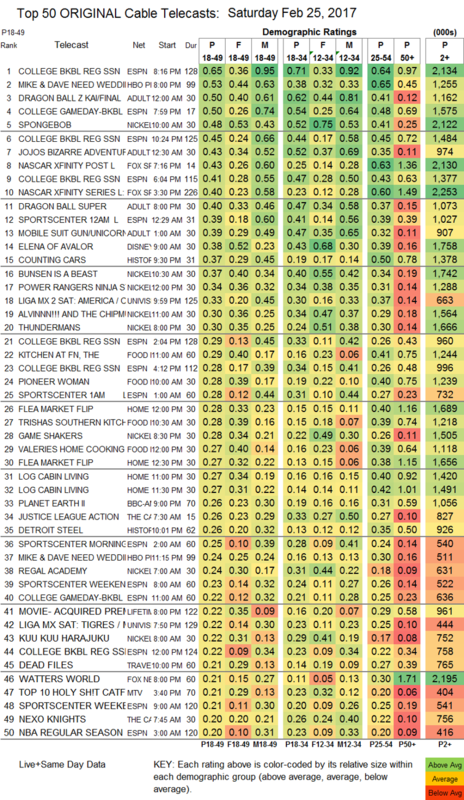 On History, COUNTING CARS was at 0.37, compared to 0.30/0.29 for 2 episodes last week, and DETROIT STEEL was up 0.05 to 0.26. On Food Network, KITCHEN AT FN rose 0.02 to 0.29, PIONEER WOMAN dropped 0.04 to 0.28, TRISHA’S SOUTHERN KITCHEN was up 0.02 to 0.28, and VALERIE’S HOME COOKING was at 0.27. BBCAmerica’s PLANET EARTH II ticked up to 0.26, with no simulcasts this week.